News Photo by Jonny Zawacki A decaying pipe is shown in the trainers room of Alpena High School. 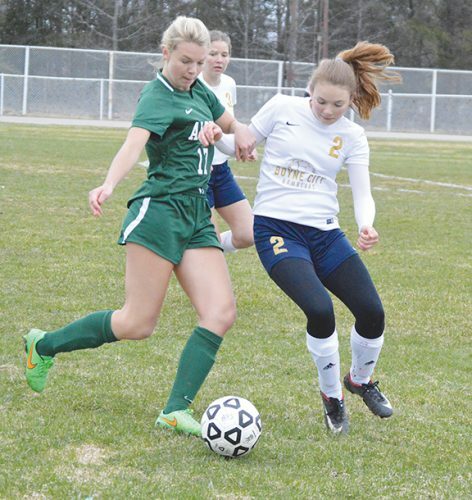 A recent $63 million bond proposal—$27 million of which would go to the high school— has been created with the hopes that major upgrades will be made throughout the school and especially the athletic facilities. The trainer’s room, weight room and locker rooms lie beneath the gymnasium in an asbestos-filled closet. It’s been over 50 years since Alpena High School opened its doors. Since 1967, thousands of students have walked through hallways, entered classrooms, changed in locker rooms, trained in the weight room and competed inside the gymnasium. Like many aging establishments, over time, small upgrades are needed and have been made to the school to maintain a safe and healthy experience for students. A recent $63 million bond proposal — $27 million of which would go to the high school — has been created with the hopes that major upgrades will be made throughout the schools, and especially the athletic facilities at AHS. News Photo by Jonny Zawacki A hazardous sign is stamped on a pipe leading into a back tunnel behind the weight room. Up until a few years ago, most of the football equipment was stored in this closet and the equipment was removed due to an ongoing asbestos issue. Much of the plan is intended to remove the window glass front located in the front oval of the school that wraps around the gymnasium and auditorium. The new design is intended to create smaller windows up top to bring natural light, but also bring the weight room upstairs, across from the gymnasium, with the locker rooms on the opposite side, located near the tennis courts and practice field, along with a new office area near the library, and an expansion of the commons area. As important as the upgrades would be, a current asbestos issue presents itself within the weight room, locker rooms and trainers office and will only get worse over time. Asbestos is a naturally occurring mineral substance that can be pulled into a fluffy consistency. Microscopic asbestos fibers cannot be seen, smelled or tasted, and it is easy for a person to inhale or swallow asbestos dust without realizing it. Courtesy Photo Alpena High’s new proposed design is intended to create smaller windows up top to bring natural light, but also bring the weight room upstairs, across from the gymnasium with the locker rooms on the opposite side, located near the tennis courts and practice field, along with a new office area near the library and an expansion of the commons area. Over time, that can become dangerous. 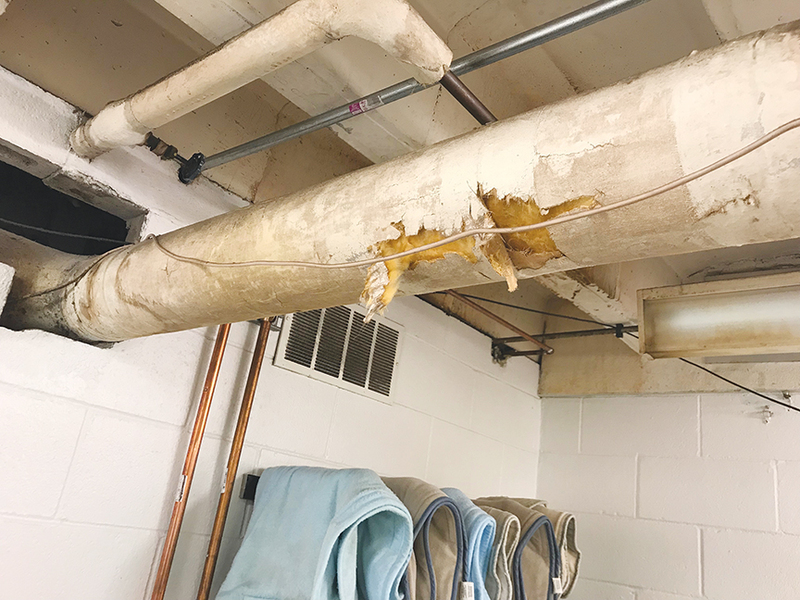 The weight room and locker room area, which lies beneath the gymnasium in the basement of the high school, is filled with pipes that have all been covered with asbestos coverings. They have been sealed off, but as the pipes are growing older, becoming more brittle, they are leaking or falling apart. When that happens, areas become contaminated. There have been several occasions where anywhere from $5,000 to $10,000 have been spent to fix leaking issues — and it’s happening all over. Throughout the locker room areas, weight room, and trainers room, there are pipes decaying and leaking. The weight room is a small, tight area that is roughly seven feet tall with pipes hanging from the ceiling. 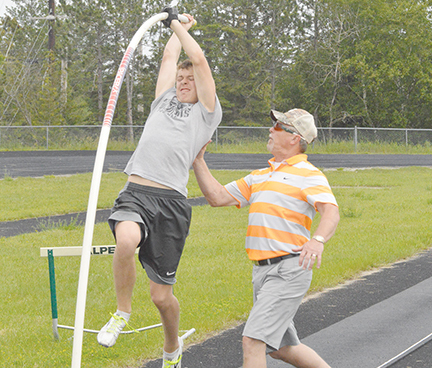 Athletes have to use extra caution when executing certain lifts, to avoid hitting the pipes. Not to mention that, at times, the room becomes very damp with all of the athletes training in a small area at one time. For many years, the asbestos closet was used to store nearly all of the football equipment that was handed out each season. 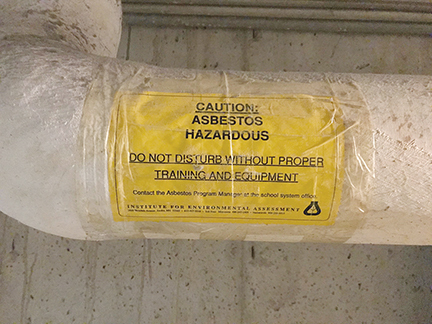 A stamp on one of the pipes entering the closet warns of a hazardous asbestos area. This past fall, members of the football team began getting rashes on their body and it took several weeks for the skin to heal and rashes to go away. It isn’t clear if that was related to the asbestos in that area of the school. Asbestos has caused other issues, however. 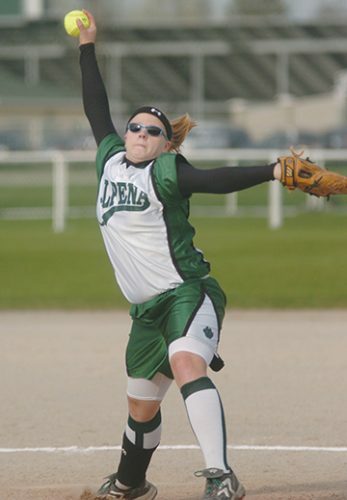 Recently, the press box at the softball field was shut down because of a roof leak and an asbestos issue in the area. That forced the program to get rid of helmets, softballs and other equipment that had been stored in the press box. There are pieces of pipes decaying in the trainer’s room and generally there is a pipe that leaks onto a desk in the trainer’s office. People who are generally in the weight room, locker room and training room areas are frequently concerned with the shape that the overhead pipes are in. VanWagoner believes it is important that everyone knows about the asbestos issues in the aging facilities. The reality of those buildings falling apart is way beyond the budget money and the school does not get any money from the state for repairs on buildings and structures. Alpena teachers, on average, are making $10,000 less than what they made in 2009, VanWagoner said. The biggest issue and question is, where will the money come from in order to make the necessary upgrades? VanWagoner believes the only avenue is to go to the taxpayers and have them understand all of the issues the school has and to try and move forward. The issues presented in the weight room and locker room areas are more than just problems that AHS athletes face, but students in general, as each student is required to complete one physical education credit hour, meaning a large portion of the student body and a handful of faculty members are being exposed to the issues on a daily basis. It’s not a great place and not a safe place to have kids in every day, but it’s what the students and faculty have and they are forced to make the best out of a poor situation.